My whitepaper published in Infosys has attracted some really good attention. It even found mention in quarterly email the CEO sends to all employees! In recent times, there has been shift in the way talent approaches career progression and job search due to changing socio-economic factors and rise of digital platforms. This is causing talent to look for opportunities in market more often and allowing talent to effortlessly search information, connect with people who could provide first-hand experience and crowd source information on organizations where opportunity exist. Organizations are seen to be behind the curve in adapting to this change and are paying the price by escalating talent acquisition costs and inability to attract top talent. This paper details the new talent phenomena and discusses how organizations could measure impact of these phenomena on them to adapt and win their War for Talent. Zappos gets rid of job postings…What are you planning? This shift is a general shift in the way corporations are thinking about talent attraction. In yesteryears companies had a simplistic view of the way talent could be attracted. They believed that talent is constantly looking for opportunities and companies need to just communicate opportunity far and wide to ensure good response from Talent. However with dwindling response to job posting on Career page, companies are puzzled how to improve their response rates. During this time, the HR thought leaders started talking like marketer; talking about differentiators! Answering “How is my company better from yours”. The world coined “Employer Branding” and the organizations embraced it. But it all happened so quick that companies never had enough time and resources to do it right. They all followed the “Me Too” approach and this led to every company project similar employer image. So the effort didn’t yield desired results. Parallel efforts led companies also to write better Job Descriptions (JD) but it too isn’t yielding much results because companies manage hundreds of JDs and improving across for all positions and customising every JD for individual openings seems an impossibility. Zappos has found its workaround, people can become part of their community and be warm candidate. JD will be customised for you and you could start and be ready to be productive very fast. Other companies will of course try to follow thsi approach and others will come up with something more innovative. But essential challenge will remain, what is being communicated to talent at large? Is it consistent, accurate and interesting enough? As long as this is right, any approach would work! Companies have always been been keen on improving predictability and control over talent supply chain. The bottle neck in the process was essentially sourcing quality talent for recruitment. Rest of the process was always more predictable and in control. Everybody today is on Social Media; excellently put by The Economist, if Facebook were a country, it would be the second most populous one! By companies establishing firm presence on social media and connecting with target talent, companies can create skill basket of talent who could readily be sourced when need arises. Of course, in theory, this system alway existed but in practice it never created starts..but now the scale that companies can achieve by leveraging social media and systematisation made possible with social ATS allows companies to execute on theoretical models better. Doing this essentially has profound impact on the hiring funnel. 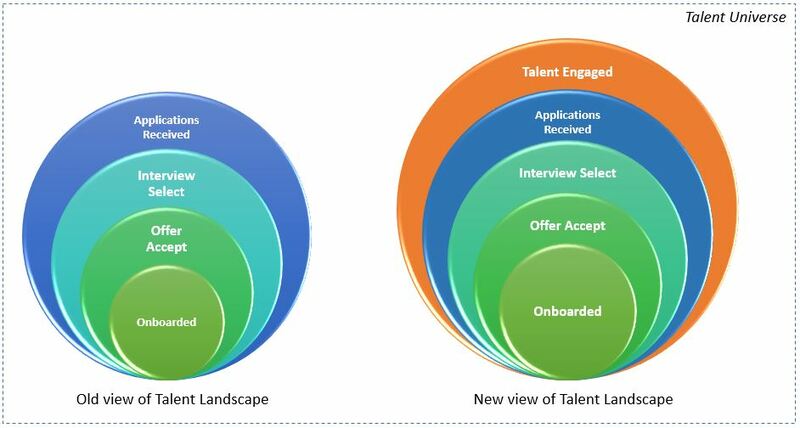 Where traditionally companies measured recruitment funnel from submission stage, now the funnel will get extended on the top to include talent listening to company, followed by talent actively engaged, followed by application received. This extension results in better control over sourcing. Emergence of Analytics has improved predictability in many aspects of business. The impact is same for talent sourcing. Historical data analysis, better predictability based on statistical models will help companies improve predictability. 1. Are companies engaging with these quasi active job seekers? Talent today is no more split between Active job seeker and passive job seeker. A large population of talent is in the grey area in between. In my experience “NO”. Although LinkedIn has allowed companies to do this to some extent, companies have by and large not identified this trend and not done much to engage with quasi job seekers. Job descriptions today still assume that the reader will apply if he finds himself suitable. How old! 2. Are companies creating platforms for co-creating enough content online for talent? Companies cannot do this all alone. They need employees, target talent, analyst and every stakeholder to create content for the company. Companies are not focusing on this ecosystem.they shoul create systems to co-create. 3. Are companies creating an ecosystem where employees are able to create positive buzz on Social Media? A few companies have done well on this parameter, creating social media policy and encouraging employees to spread positive buzz. Companies have adopted technology to allow their employees to share news about jobs and happenings with their friends. Adoption of these technologies and methods is still not widespread and there is more that companies could do.